I love to quilt! My grandmother taught me how to quilt, my daughter is a quilter and we’re teaching my granddaughters how to quilt. As I was growing up I remember my grandmother spending her evenings handstitching quilts together. Two of my favorites that she made (and that I’ve made for my children) are the Beautiful Butterfly Quilt and the BowTie Quilt. My daughter’s favorite is one that she made while in college – her famous Patch “Puff” Quilt. Wow – she could have started her own quilting business when her friends saw and felt that wonderful soft puffy quilt! The important question is – what kind of special quilting tools/supplies/notions do you use most? 3-Piece square cut ruler set – this set has 3 different size squares – 6 1/2″, 4 1/2″ and 3 1/2″ – made of heavy acrylic, and is perfect for most of the quilting squares that I make. Pyramid cutting ruler – I use this ruler for my quilting patterns that need a precise triangle measurement. This ruler is designed to cut triangles from 1″ to 6″. Quilting Glass Head Pins – I like the heads on these pins and, you guessed it — they STAY in my quilting “corner”, so they don’t get mixed in with my regular sewing pins. Quilt Halo – free motion quilting tool – This tool is designed for free motion quilting, but it is also very useful for the free motion embroidery that I do to personalize items for the grandchildren. Very useful tool! I like to hear what YOUR favorite quilting items are, and let me know if you are also passing your quilting skills down to the next generation of quilters. Add New Dimension to Your Sewing — Make Memory Quilts! 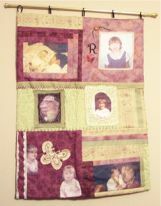 Memory quilts, like the one above, can be done several ways. The finished size of the wall hanging memory quilt shown is 23″ x 32″ tall, and has loops at the top in order to use a dowel for hanging. This particular one has fabric pieces of various sizes sewn together, with colors and print ideas chosen by the mother of the little girl. The pictures were all made by scanning them and printing them on printable fabric (fabric by June Taylor) in an ink jet printer (you can’t use a laser printer for these pictures because the ink will rub off). You can see that the pictures are not in any type of sequence, but rather just as a collage. The lower left square has two little pictures in it, with a decorative butterfly applique. The middle right picture has been made to appear like it is in a picture frame, with lace edging surrounding it. I have seen memory quilts that have been made for a particular child as a gift when the child heads off to college. 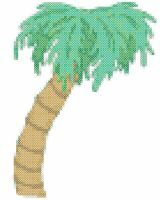 The one in particular that I’m thinking about had pictures of the child all the way from Kindergarten to high school senior made on the printable fabric. As the quilt was pieced together, squares were added that had a poem that the child had written in the 6th grade, an art picture that was made in middle school, a copy of a cute Mother’s Day card that had been made at school, etc. This type of memory quilt was indeed a full size quilt, but I rather doubt that the daughter ever actually used it on her bed. Quilting is a bit time consuming, however people are willing to pay for these timeless treasures if they can only find someone who will do the work for them. The memory quilt wall hanging took several months to complete, as the seamstress worked on it a little at a time, as she did her other sewing projects, in order that her main business of sewing and alteration work could still be completed in a reasonable time. With a little imagination there is no limit to what can be done with memory quilts. For those quilters, crafters and sewers who generally need to do a lot of fabric cutting, I’d recommend the AccuQuilt GO! Fabric Cutter. For those of us who have some arthritis in the hands / fingers, this machine is really a Godsend! Not only is this fabric cutter 90% faster than rotary cutting and scissors, it is accurate, safe and easy to use. There are many dies you can get that give you a variety of choices of “cuts” of fabric, so you can create tons of projects. Quilting any type or style of quilt requires hours and hours of time cutting the small pieces (even larger pieces take considerable time cutting), and this machine can help you get through the cutting process quickly. In addition, the AccuQuilt GO! 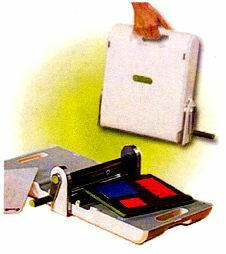 Fabric Cutter has its own case so you can close it up and take it with you from room to room, or even to those quilting parties you may attend. Clotilde carries this machine, and while it is a little pricey (around $350), it can really save wear and tear on your hands, in order to allow you to do the sewing and quilting that you love.